Houses are a superior real estate investment opportunity, also of interest as offshore investment. Scroll down for taxation status and investment information on St. Kitts. 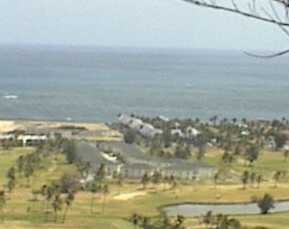 The houses are located in St. Kitts' prime residential area, directly on the golf course overlooking a green. All units are fully furnished and centrally air conditioned. The development has 2 swimming pools, and the beaches are within walking distance. The area is very safe, and in close proximity to restaurants and shopping. The past has shown that the houses are hurricane safe. For further information on the island, including maps and facts, click on the links below. There is no personal income tax in St. Kitts and Nevis. St. Kitts and Nevis operate on Atlantic Standard Time throughout the year. The climate is tropical. Temperatures average 81 degrees Fahrenheit (27 degrees Centigrade) with steady, cooling breezes throughout most of the year. There is no rainy season as such. The average annual rainfall in St. Kitts and Nevis is 58 inches. The currency of St. Kitts and Nevis is the Eastern Caribbean dollar, currently valued at EC$2.70 to US$1.00. Water: The water in St. Kitts and Nevis is good quality and is suitable for drinking. The cost for industrial or commercial use is US$0.07 per 100 gallons or part thereof used each month. Electricity: General Services: Applicable for all services and temporary supplies. Domestics Service: Served by a 230 volt single phase supply. Charge: Energy charge of 18 cents per unit with minimum total of US$2.22. Energy Charge: For the first 50 units, 11.8 cents per unit. For the next 75 units, 11.1 cents per unit. All the exceeding 125 to be charged at 10.3 cents per unit. Demand Charge: For the first Amps of fuse rating or part thereof of fuse protecting service, US$2.22. For the next 15 Amps of fuse rating or part thereof fuse-protecting service, US$1.48. For additional fuse rating exceeding 30 Amps of fuse protecting service, US$1.85. Under the Fiscal Incentives Act, four types of enterprises qualify for a tax holiday. The length of the tax holiday for the first three depends on the amount of value added in St. Kitts and Nevis. The fourth type, known as enclave industry, must produce goods exclusively for export outside the CARICOM region. Export Allowance St. Kitts and Nevis provides companies with a further tax concession effective at the end of the tax holiday period. In effect, it is a rebate of a period of income tax paid based on export profits as a percentage of total profits. Exemption from Import Duties: Full exemption from import duties on parts, raw materials and production machinery. Export Processing zone: The Government is developing a plan to establish an export processing zone near Golden Rock Airport. Hotel Aids Ordinance: The Hotel Aids Ordinance provides relief from customs duties and pier duties on items brought into the country for use in the construction, extension and equipping of a hotel of not less than 10 bedrooms. In addition, the Income Tax Ordinance provides special tax relief benefits for a hotel proprietor who has been granted a license under the Hotel Aid Ordinance. This stipulates that the gains or profits of a hotel of more than 30 bedrooms are exempt from income tax for 10 years. If the hotel contains less than 30 bedrooms, gain or profits would be exempt from income tax for 5 years. Repatriation of Profits: Companies registered with the Federation of St. Kitts and Nevis can repatriate all profits, dividends and imported capital. Protection of Investment: The Government of St. Kitts and Nevis and the United States has entered into an Investment Guarantee Agreement. For further inquiries or to make an offer, contact the owner at the email address below.